Camden is a medium-sized city located in the state of New Jersey. The city has a population of 76,005 inhabitants. Camden has a population density of 8,522 people per square mile. This would be considered well above the national population density level. More than a quarter of the residents of Camden identify themselves as Hispanic or Latino, and 41% of the population speak Spanish as their primary or secondary language. The median age of all Camden residents is 29, which is well below the national average. This is a good indication that this city could be ideal for young singles. All the single ladies (and all the single fellas) might want to take notice as only 31% of the Camden population is married. Without the right tools, relocating to any new area can be very stressful and challenging. Living in Camden, New Jersey could be a good experience for anyone who puts in the time to do the research required. Using the livability score which includes data from categories like amenities, crime, cost of living, education, housing, you can easily compare the best places to live in Camden and also determine if there are any nearby cities that might be a better match for your lifestyle. 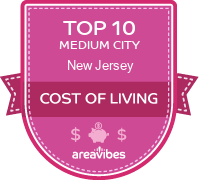 You can also compare Camden to New Jersey and the national average. Camden has a livability score of 56/100 and is ranked #518 in New Jersey and #26,812 in the USA. This is a poor rating when compared to the average of other places in the country. Something also worth noting is that Camden ranks among some of the lowest scoring cities in the USA, with more than 90% of cities obtaining a higher score. If we take a closer look at each of the categories individually, we see that Camden ranks well for amenities (A+). Camden does not do well for the following: crime (D-), education (F), employment (F) and housing (F). It might be a smart idea to take a closer look at each category to find out why. Based on the proximity of local amenities like grocery stores, restaurants, coffee shops, parks, librairies, etc., Camden has received a higher than average score for its local amenities. If you’re planning on relocating and making this area your permanent home, it’s nice to know that there is an ample amount of amenities and things to do within walking distance or a short drive. Some of the interesting things to do and attractions include: Adventure Aquarium, Battleship New Jersey, and Campbell's Field. Assuming that Camden meets all of your requirements, the next most important item to examine is the affordability of real estate in Camden. Everything else becomes a lot less important if it turns out that home prices in Camden are simply unattainable. The median home price for Camden homes is $82,800, which is 73.8% lower than the New Jersey average. If we take a closer look at the affordability of homes in Camden, we’ll see that the home price to income ratio is 3.2, which is 25.6% lower than the New Jersey average. How Do You Rate The Livability In Camden? Camden, NJ may have once been an industrial center and a decent city, unfortunately those days appear to be long gone. I visited Camden, NJ in 2009 for about three days. I also lived in NJ my entire life and have passed through Camden, NJ on several different occasions. There are no attractions that really warrant a visit to Camden, NJ. Camden, NJ may be a decent location to find a cheap hotel in NJ if you want to avoid the high pricing of surrounding areas. Camden, NJ has a rather run down feel and there is a high-level of street violence. I did not experience any violence while I was there although I noticed many shady neighborhoods. If you must stay in Camden, NJ there are several things you can do to make the best of the stay. One of the best attractions in Camden, NJ is the vibrant waterfront located on the Delaware river. There are several decent dining spots and even a few nightclubs along the waterfront. Another interesting place to visit is the Campbell Soup Headquarters which is in Camden, NJ. As a city, Camden, NJ suffers extensively from urban decay, a poor school system and high violence making it a poor choice for living. Source: The Camden, NJ data and statistics displayed above are derived from the 2016 United States Census Bureau American Community Survey (ACS).